I love the farm share. I love getting random vegetables every week. I love the adventure of trying to run out the clock by using them all up by the next pick up. What I hate is the mandatory volunteer shift. After four years of farm sharing and getting out of the volunteer component my time was up and, today, I finally had to do it. It's not that I don't want to help out it's that there really isn't anything to do once you put all the vegetables on a table. Then you have to just sit there for three hours and make small talk with strangers. The only thing I hate more than strangers is small talk. The first two years I was able to get out of volunteering by offering web hosting services to the farm. Last year I got out of volunteering because a hurricane destroyed the farm. That was probably the only good thing to come out of that hurricane. This year there was nowhere to run. The time was upon us. It was time to pay the piper. This week I got to set up the vegetables and had first pick, putting my vegetables aside under the awning so that they didn't get soaked in the immediate pouring rain that drenched us as we handed out the vegetables. 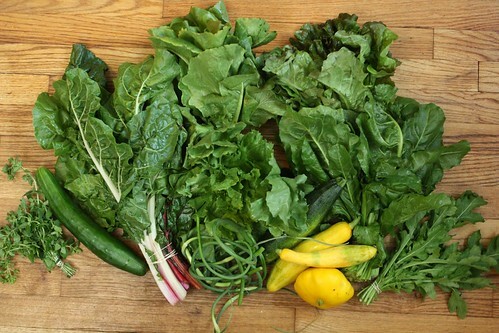 This week we got two pounds of summer squash, six garlic scapes, one head of red leaf lettuce, a head of romaine lettuce, a head of escarole, one bunch of arugula, Bright Lights Swiss Chard, summer spinach, a cucumber, and oregano. 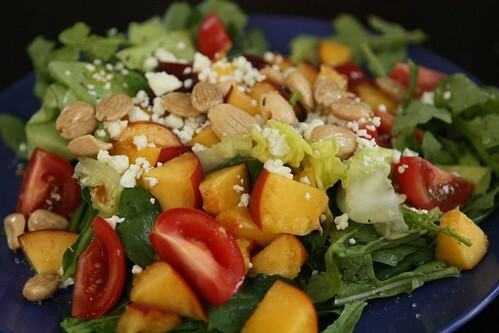 After getting home late from a long day of volunteering (which mostly involved sitting around, greeting people, and telling them to have a nice night) I had to act fast so I made this quick salad with leftover green leaf lettuce from last week, arugula from this week, sliced peaches, tomato, feta, Marcona almonds, olive oil, salt, and pepper. Even Jen, the recent hater of salads, ate her entire salad. I figured if I piled enough ingredients she loves on top of the lettuce I may have a better shot at getting her to eat her greens. After dinner I had my favorite dessert: beer. With temperatures dipping into the 50s tonight I opted to have a delicious beer for dessert. 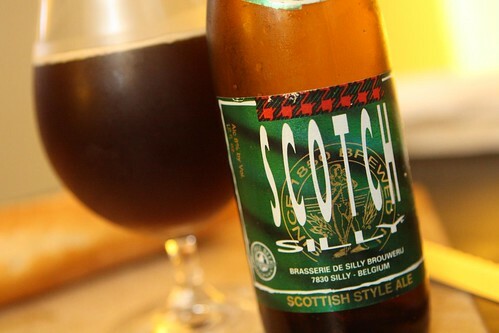 I chose this Scotch Silly from Brasserie de Silly in Belgium. It's been in the fridge for four or five months and I've been saving it for a very special night and with the cooler nights behind us this was the perfect evening to enjoy this beer with an episode or two of the final season of Eureka. Ahh, Sheriff Jack Carter, you are my favorite way to end the day. 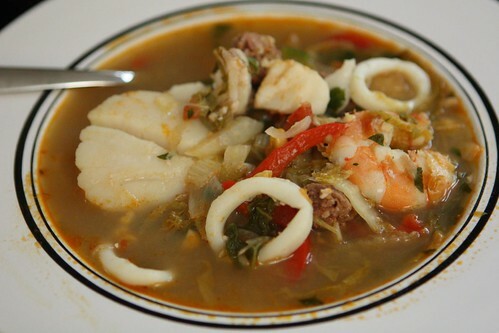 Labels: beer, Ethnic, Film and TV, How'd we use it?, salad, soup, What'd we get? I was looking at the bcreamed spinch you made the other night and realized that A) I had never made or I think eaten creamed spinach and B) I had spinach and Swiss Chard. For some reason when I read the ingredients I thought sour cream not heavy cream, used allspice instead of nutmeg and threw in the last of the feta that was lingering since your Xmas visit along with the parmesan. Turned out pretty good I thought, but then I had nothing to compare it against. I was just telling Nate that we never really ate creamed spinach when I was growing up - but it's pretty damn delicious. Your version sounds delicious. I'm glad your version turned out well, uberlours. Creamed spinach is remarkably tasty. I don't think I even knew creamed spinach was a dish when you were growing up. Like green bean casserole perhaps, something that was whispered about. Both dishes seem somewhat Paula Deanish.